1. I will respect the rules and procedures set down by the G.A.A’s Code of Ethics and Good practice for young players. 2. I will respect my child’s team-mates, Mentors, (e.g. Managers, Coaches, Selectors) and any other parents as well as players, parents and Coaches from opposing teams. I will encourage my child to treat other player’s Coaches, Selectors and Managers with respect. 3. I will give encouragement and applaud positive accomplishments whether from my child or his/her team-mates, his/her opponents or the officials. 4. I will respect all officials and their authority during matches. 5. I will never demonstrate threatening or abusive behaviour or use foul language. 6. I will inform team mentors of any medical condition which my child may suffer from. Owenmore Gaels GAA Club wish to provide the best possible environment for all players involved with the club. Players deserve to be given enjoyable, safe sporting opportunities, free of abuse of any kind. These players have rights, which must be respected, and responsibilities that they must accept. · Be safe and to feel safe. · Be listened to and be believed. · Be treated with respect, dignity and sensitivity. · Have a voice in the club/organisation. · Participate on an equal basis. · Have fun and enjoy sport. · Experience competition at a level at which they feel comfortable. · Make complaints and have them dealt with. · Get help against bullies. · Protect their own bodies. · Treat all mentors (coaches, managers, selectors, club officials etc.) with respect. · Respect team members – even when things go wrong. · Respect opponents – be gracious in defeat. · Abide by the rules set down by team managers when traveling to away events. 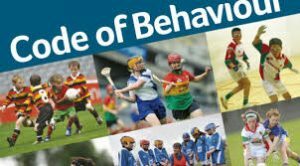 · Behave in a manner that avoids bringing the sport of Gaelic Football into disrepute. · Talk to the Club Officials if they have any problems. · Use violence or physical contact that is not allowed within the rules. · Shout or argue with officials, team-mates or opponents. · Harm team members, opponents or their property. · Bully or use bullying tactics to isolate another player. · Use unfair or bullying tactics to gain advantage. · Keep secrets, especially if they have been caused harm. · Tell lies about adults/other players.